A published paper by Schneider National reveals its sleep-apnea screening and treatment program has generated a return on investment in the form of savings on medical costs, accident reduction, reduced turnover and increased productivity. Among 348 drivers diagnosed with sleep disordered breathing (SDB) and who were treated, medical costs accrued were slashed in half per month. There was a 73% reduction in preventable driving accidents among a group of 225 SDB-diagnosed drivers treated with continuous positive airway pressure (CPAP) devices. The driver retention rate of CPAP-treated individuals was 2.29 times greater when compared to that of the total company driver population in 2004. 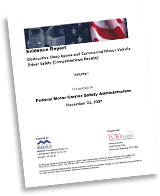 The Schneider white paper was made available to Fleet Owner shortly after the American College of Chest Physicians, American College of Occupational and Environmental Medicine and the National Sleep Foundation offered a joint recommendation on how FMCSA should update its standards so that DOT medical examiners could more effectively screen for sleep apnea. Sullivan acknowledged that the funding of Schneider’s sleep apnea screening and treatment program was largely thanks to the size of the company. However, she fully supports the joint recommendation. Mark Berger, founder of Precision Pulmonary Diagnostics, a sleep apnea solutions provider for the trucking industry, has worked with Schneider to “vertically integrate” its screening and treatment program and also conducted the research behind the white paper. Indeed, that’s one of the major reasons why drivers avoid receiving a diagnosis of sleep apnea.